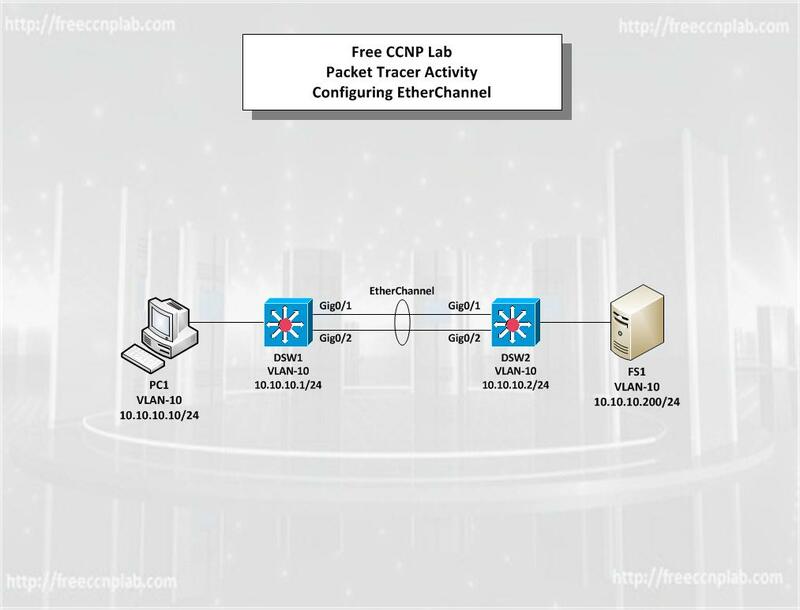 EtherChannel is a port link aggregation technology or port-channel architecture that allows grouping of several physical Ethernet links to create one logical Ethernet link for the purpose of providing fault-tolerance and high-speed links between switches. An EtherChannel can be created from between two to eight active Fast, Gigabit Ethernet ports; with an additional one to eight inactive (failover) ports which become active as the other active ports fail. EtherChannel is primarily used in the backbone network, but can also be used to connect end user machines. In this scenario, you will bundle two Gig Ethernet links to form a single logical link with an effective full-duplex bandwidth of 4 Gb/s. This lab has been created with Packet Tracer version 5.3.3 due to the lack of switching support in GNS3. Although the lab can be completed in GNS3 using a switching module in a router or with actual hardware. Practices what we have learned in previous labs. Observe the VTP status on DSW1 and DSW2. Enable EtherChannel on DSW1 interfaces Gig0/1 and Gig0/2. Configure DSW1 interfaces Gig0/1 and Gig0/2 as dot1q encapsulation. Configure DSW1 interfaces Gig0/1 and Gig0/2 as Trunking. Create an Channel-Group 1 and assign the mode as desirable. Enable EtherChannel on DSW2 interfaces Gig0/1 and Gig0/2. Configure DSW2 interfaces Gig0/1 and Gig0/2 as dot1q encapsulation. Configure DSW2 interfaces Gig0/1 and Gig0/2 as Trunking. On DSW1 create Port Channel 1 interface. Assign the Port Channel interface as Trunking. On DSW2 create Port Channel 1 interface. Configure the Port Channel load-balancing to be src-mac on DSW1 and DSW2. Verify the EtherChannel Configuration on DSW1 and DSW2. On DSW1 create VLAN 10. Assign port Fa0/10 of DSW1 and DSW2 to VLAN 10 as Access. Verify the VTP status on DSW1 and DSW2. Ping Server FS1 from PC1.